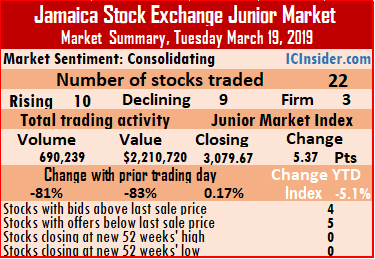 Trading dived sharply on the Junior Market of the Jamaica Stock Exchange on Tuesday, ending in an exchange of only 690,239 units valued at a mere $2,210,720 compared to 3,646,013 shares valued at $12,828,763, on Monday. At the close of trading, 22 securities changed hands, compared with 26 on Monday. The market index rose 5.37 points to close at 3,079.67 as the prices of 10 securities rose, 9 declined and 3 remained unchanged. Trading ended with an average of 31,375 units for an average of $100,487 in contrast to 140,231 units for an average of $493,414 on Monday. The average volume and value for the month to date amounts to 182,206 shares valued at $763,762 compared to 193,454 shares valued at $813,227 on the previous day. In contrast, February closed with average of 235,225 units valued at $679,790 for each security traded. IC bid-offer Indicator| At the end of trading, the Investor’s Choice bid-offer indicator reading shows 4 stocks ended with bids higher than their last selling prices and 5 with lower offers. 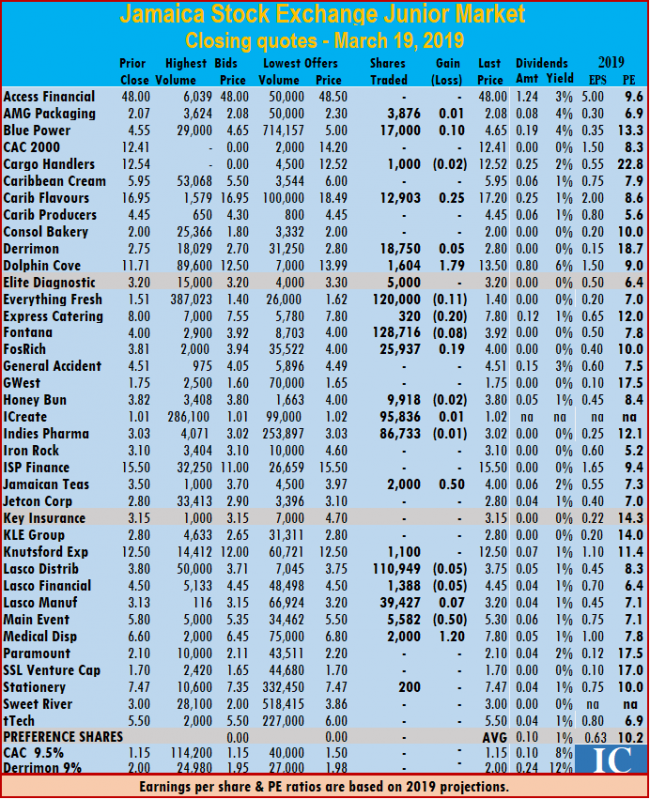 At the close of the market, AMG Packaging ended 1 cent higher at $2.08, with 3,876 stock units changing hands, Blue Power concluded trading of 17,000 units, for 10 cents higher at $4.65, Cargo Handlers settled with a loss of 2 cents at $12.52, with an exchange of 1,000 shares. Caribbean Flavours traded 12,903 stock units rose by 25 cents to $17.20, Derrimon Trading gained 5 cents to close at $2.80, with 18,750 shares changing hands. Dolphin Cove concluded trading of 1,604 shares and rose $1.79 higher to close at $13.50, Everything Fresh finished with a loss of 11 cents at $1.40, with an exchange of 120,000 stock units, Elite Diagnostic settled at $3.20, in trading 5,000 units, Express Catering ended trading 320 shares with a loss of 20 cents at $7.80. FosRich Group traded 25,937 shares 19 cents higher at $4, Fontana finished trading 128,716 shares, with a loss of 8 cents at $3.92, Honey Bun concluded trading 9,918 shares with a loss of 2 cents at $3.80. 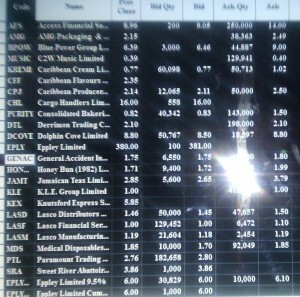 iCreate rose 1 cent and closed at $1.02, with an exchange of 95,836 shares, Indies Pharma finished with a loss of 1 cent at $3.02, with the trading of 86,733 shares, Jamaican Teas traded 50 cents higher at $4, with 2,000 units passing through the market, Knutsford Express concluded trading of 1,100 stock units at $12.50. Lasco Distributors finished with a loss of 5 cents at $3.75, with the trading of 110,949 units, Lasco Financial settled with a loss of 5 cents at $4.45, with 1,388 shares changing hands, Lasco Manufacturing ended trading 7 cents higher at $3.20, in trading 39,427 shares. Main Event traded of 5,582 shares, with a loss of 50 cents at $5.30, Medical Disposables finished trading $1.20 higher at $7.80, with 2,000 stock units and Stationery and Office concluded trading of 200 shares at $7.47.